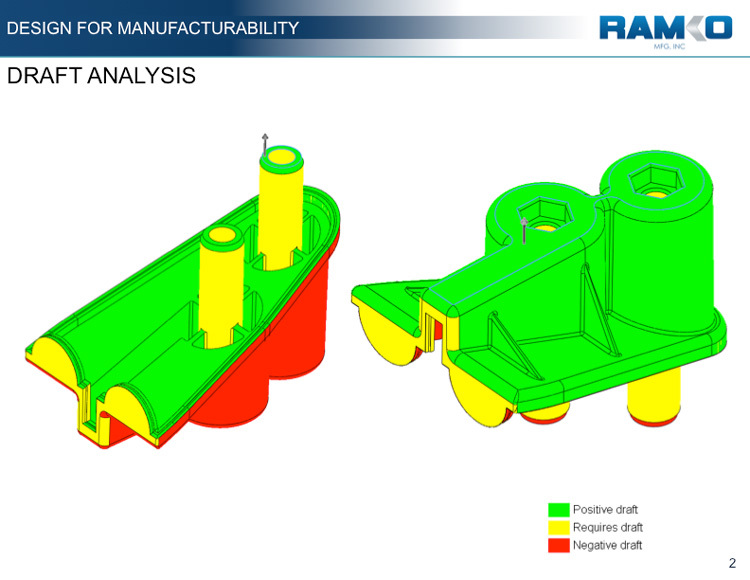 Early involvement in part and mold design using Ramko's SmartStart™ Design For Manufacturability (DFM) Review is key to successful part and product development. At Ramko, we emphasize the benefits of DFM to our clients with the knowledge that this powerful diagnostic tool will create a more efficient production cycle and ultimately increase profitability. SmartStart™ DFM allows for an intensive review of the proposed part design, providing our clients with critical information to help diagnose part and production issues. Our state-of-the-art CAD diagnosis can dissect the part and mold flow routes from the core to external exit points. Because our DFM analysis happens BEFORE the manufacturing cycle begins, we can help you avoid costly online production errors and downtimes by identifying problem areas that require design modifications. These critical adjustments also help optimize the tooling, molding, and quality of the finished product. SolidWorks® 3D CAD is a design application that enables users to quickly transform concepts into solid 3D products. Powerful toolsets, virtual prototyping, and quick generation of manufacturing-ready drawings help designers create cost-effective parts in a real world manufacturing environment. SimpoeWorks is a complete plastic injection simulation solution fully embedded into the SolidWorks graphic user environment. 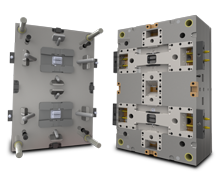 R & B MoldWorks® is the premier 3D solid-based mold design application that delivers innovative, intuitive, intelligent design tools for the injection molding industry. To learn more about these applications, click the logos above or visit our links page. View SmartStart™ Design For Manufacturability (DFM) Review examples to get an idea of how SmartStart™ works. 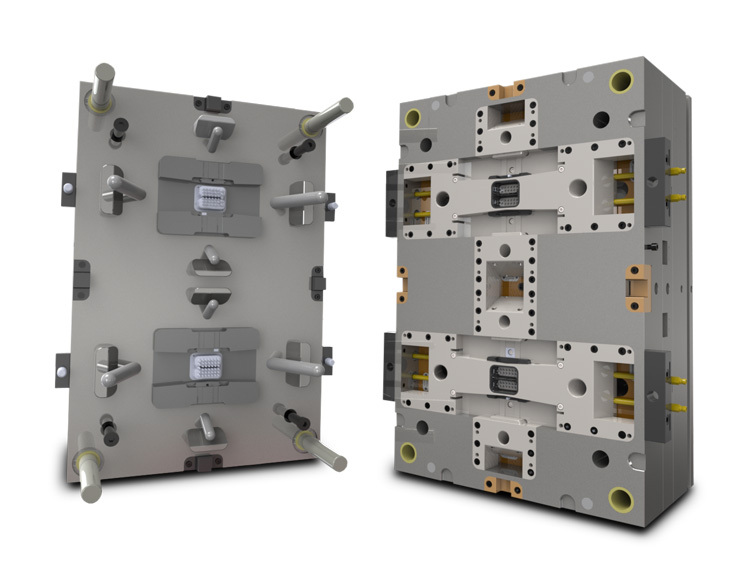 SimpoeWorks, a plastic injection simulation application is embedded into the Solidworks user environment, providing a truly seamless integration of part design, mold flow analysis, and mold design. 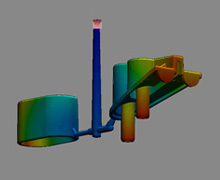 By using Simpoeworks, we can simulate the injection molding process, optimize molding parameters, and identify potential tooling and molding problems in the early design stages. 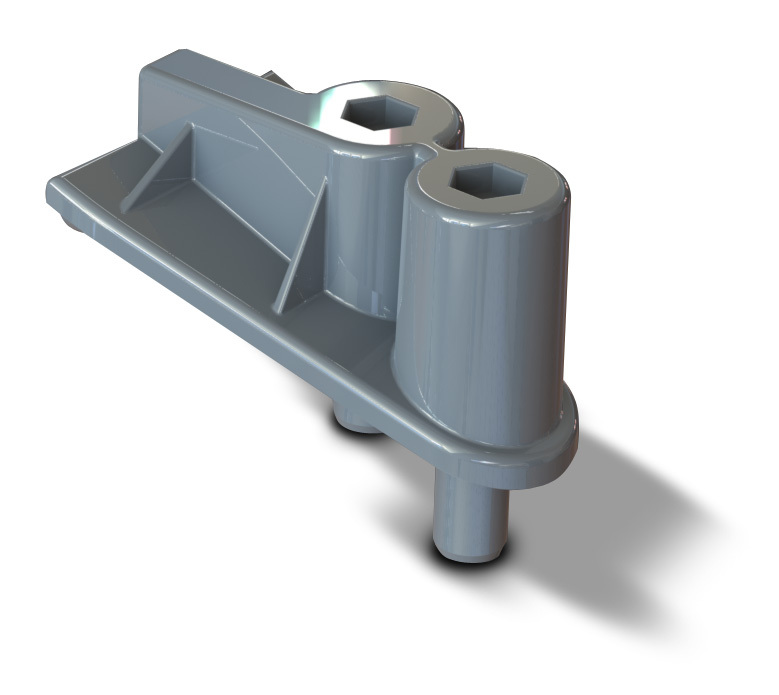 MoldWorks®, a 3D, solid-based mold design application is seamlessly integrated into SolidWorks®. It incorporates preset mold components which can help decrease mold design time. 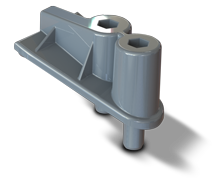 By using Parametric 3D CAD mold design, we are able to employ CAM (Computer Aided Manufacturing) in a near paperless environment. Our PDM (Product Data Management) system ensures that incoming and outgoing files are tracked and managed. We utilize our ECN (Engineering Change Notice) system to control and verify design revisions. 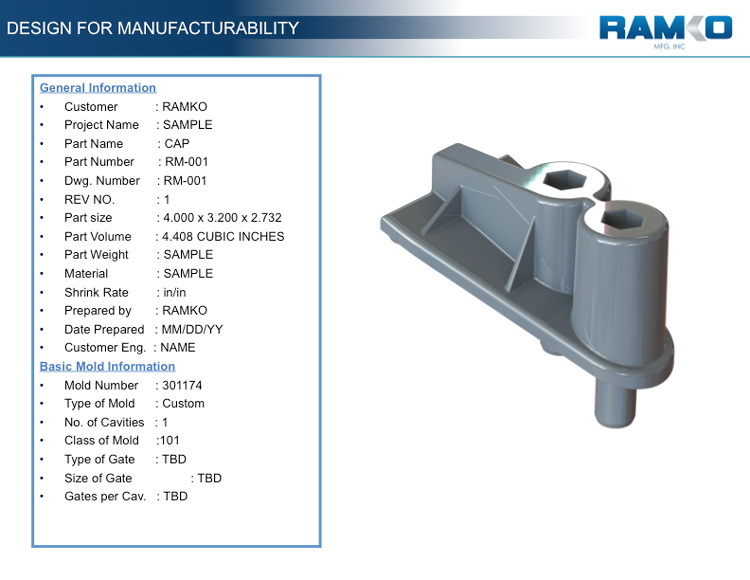 Ramko's extensive tooling and manufacturing experience is an invaluable resource in resolving production gaps that can occur with creative product concepts within the limitations of a manufacturing environment. Ramko can take your initial product idea and turn it into a manufacturable part design while keeping the quality, aesthetics, and functionality of your original product concept. 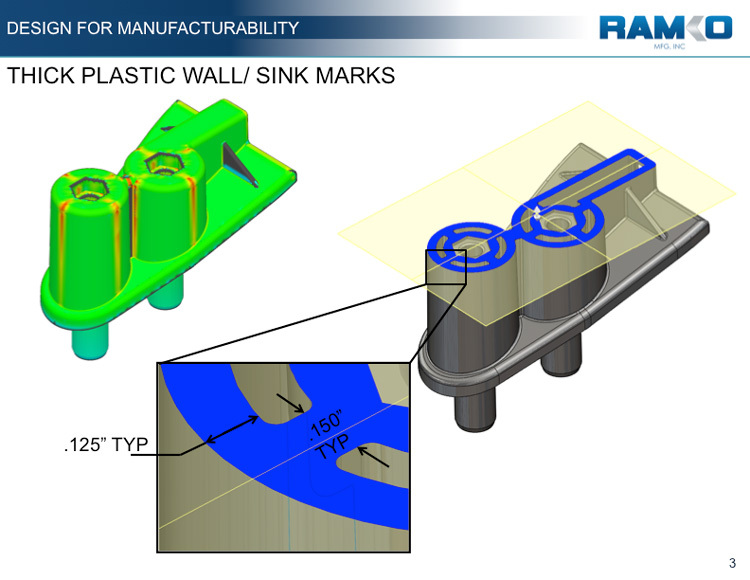 Ramko's SmartStart™ program is value-added engineering service that reduces mold manufacturing costs, shortens production cycles and time to market.